SportDOG's most versatile collar, with more levels of correction and patented bark detection technology. No programming. Automatically stops barking. PerfectBark technology eliminates false corrections that can occur with other no bark systems. The SportDOG Brand NoBark 18 will never mistake anything for your dog's bark except, well, your dog's bark. The patented design requires both the sound of your dog's bark and a tangible vibration from the bark to occur at the same time before it corrects your dog. Every other anti-bark system available triggers off of one or the other, but not both. Simple to use. Just turn the battery to the on position, put it on your dog, and select the correction range you want. Hear the quiet? 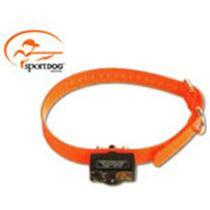 SportDOG Brand. Gear the way you'd design it.